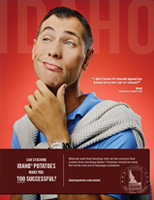 The Idaho Potato Commission (IPC) is one of the few commodities groups that use a variety of marketing tools to promote potatoes. We actively support our retailers through creative and strategic advertising and public relations campaigns. Our national television advertising campaign encourages folks to always look for the famous "Grown in Idaho" seal. We've established a successful partnership with the American Heart Association to certify Idaho® potatoes as a heart-healthy food low in saturated fat and cholesterol. What better way to drive home our message as America's favorite potato than by showcasing our Great Big Idaho® Potato Truck in our National TV Commercial.